Being in zero gravity, astronauts are constantly fighting with tools floating away. The carabiner tool clip solves this problem. The clip can hold 4 hex sockets and 5 driver-bits. The carabiner portion allows astronauts to clip the tool to themselves or other tethered objects. The removable clasp feature has rounded profiles to allow for a self aligning snap fit. 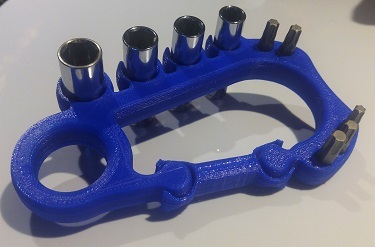 This tool holding carabiner concept could be incorporated into a carabiner that is tethered to astronauts on the ISS while on spacewalks. The part is completely 3D printable with no support needed. This was designed to print in place and be functional when removed.The part fits on the specified build platform, and when printed has a solid volume of 43.31cm^3 .